[map] [street view] East of Saltillo, south of MS-363 along County Road 1451 near its intersection with County Road 1325. [Image] RDS display showing the station's PI (call sign) and Radio Text fields from an Insignia portable radio. Came on the air in 1976 as a 3 kW class A signal serving Booneville and the surrounding area. Received an upgrade to 6 kW in the early 90s. Was sold to Clear Channel by Community Broadcasting Services of Mississippi in 2001; in 2006 they received a permit to increase power to a class C3 level and move the transmitter site south towards Tupelo. 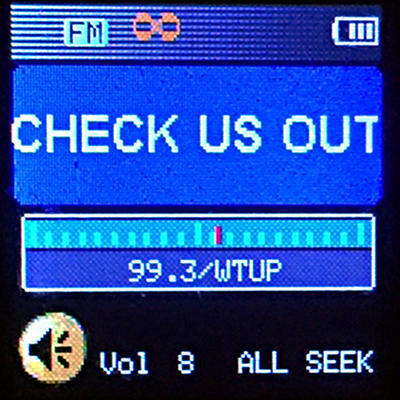 Prior to 2016 it was WBVV and southern gospel, but at the end of July 2016 iHeart flipped the station to classic hits as "Big 99.3". This format had been on AM sister station 1490 WTUP and now the AM and FM are simulcasting. Shortly after the flip the FM's calls also changed to WTUP-FM.